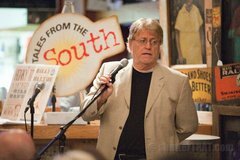 Tales from the South is true stories told by the Southerners that lived them, in front of a live audience during dinner at Starving Artist Cafe' in the Argenta Arts District of North Little Rock. The ancient art of storytelling over a great meal is still alive! Tales from the South is a 29-minute weekly radio show recorded in front of a live audience at Starving Artist Cafe' in the Argenta Arts District of North Little Rock, Arkansas. Each week, everyday Southerners read their own true story, unrehearsed and live. Local musicians play during dinner, and blues guitarist Mark Simpson plays on the show. Stories range from funny to sad, to enlightening to touching. The connection to the South is the writer, not the setting of the story-- however, most of the stories are set in the South. Although the show itself is unrehearsed, the literary memoirs have been worked on for weeks leading up to the recording. All stories are true and told by the Southerners who lived them. Summer Season 2011 begins with recording date 06/07/11 and ends with the season finale 08/30/11.